The Los Angeles Dodgers were dealt a tough blow last week when they learned closer Kenley Jansen would be out for at least a month. Jansen needs to receive treatment after experiencing an irregular heartbeat in Denver on Thursday. However, the Dodgers have been quick to respond to that adversity. On Sunday, Dodgers manager Dave Robert announced that starters Kenta Maeda and Ross Stripling were being moved to the bullpen. The loss of Jansen combined with a handful of other relievers already on the DL left the Los Angeles bullpen depleted. Even with Jansen having another outstanding year, the Dodgers had a fairly average bullpen. In need of some help, Roberts was quick to tap Maeda and Stripling as the pitchers to move to the bullpen. Stripling has pitched as both a starter and reliever over the last three seasons. That should make for an easy transition for him despite his success as a starter this year. Maeda, meanwhile, has limited experience as a reliever. However, considering the team’s bullpen at the moment, he was open to the idea of moving to the ‘pen. 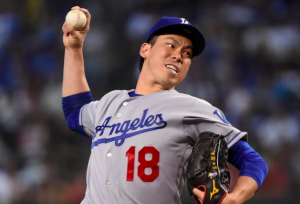 Maeda actually made nine relief appearances during the postseason last year. In that role, he posted a 0.84 ERA. With no set closer at the moment, Roberts has indicated that Maeda will be used in high-leverage situations. His ability to pitch multiple innings could also prove to be quite useful. Stripling, meanwhile, has posted a 0.59 ERA in 11 relief appearances this season. He’s thrown 15.1 innings over that span. After being named to the all-star team, Stripling struggled in his first couple of starts following the all-star break. Moving to the bullpen could be what he needs to get back on track. What makes moving Maeda and Stripling to the bullpen possible is the upcoming return of both Hyun-Jin Ryu and Alex Wood. Both are expected to come off the DL this week while the Dodgers entertain the Giants for a three-game series. They will join Clayton Kershaw, Rich Hill, and Walker Buehler to form the new Dodgers rotation. Ryu had a great start to the season before he was sidelined by a groin injury. In six starts, he was 3-0 with a 2.12 ERA and is finally ready after more than three months on the shelf. Wood, on the other hand, had a minor case of adductor tendinitis and will rejoin the Los Angeles rotation after a brief absence. Oddly enough, the Dodgers have struggled with rotation health for much of the season. However, they now have a surplus of starters, which will enable them to send a couple to the bullpen during a time of need. Maeda and Stripling may not be able to replace Jansen in the closer’s role. However, their presence in the bullpen should make it a lot easier for the Dodgers to survive the absence of their closer while engaged in such a right race in the NL West.